14K yellow gold and a diamond combine to make a beautiful "Salvation by Faith" diamond cross pendant from Apples of Gold Jewelry. This women's pendant is an amazing pendant to pair with a favorite chain through the hidden bale behind the cross. The budded, cut out arm design of the cross, is polished and leads up to a single diamond in the center of the cross. The diamond is G-H color rated and I1 clarity rated, and totals 0.015 carats. The yellow gold and the diamond are eye-catching and beautiful, making this the perfect chocie for a variety of occasions. "For the grace of God that bringeth salvation hath appeared to all men,"(Titus 2:11). 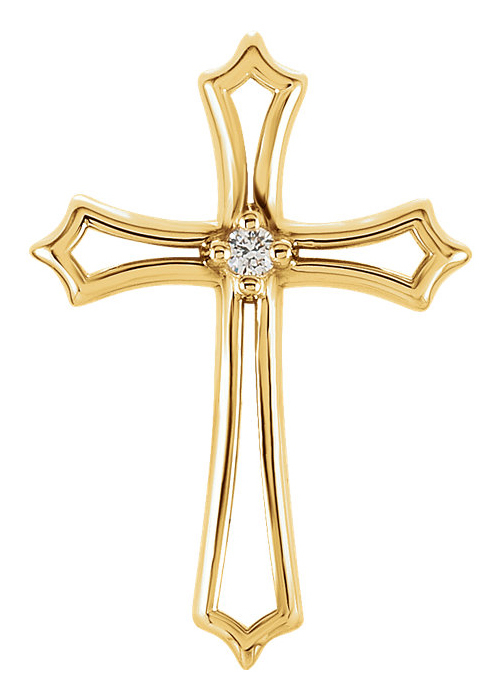 We guarantee our Salvation by Faith Diamond Cross Pendant to be high quality, authentic jewelry, as described above.